Our 41 customer-owned utilities that serve power to approximately 4.4 million of the state’s 9.8 million residents. Manage a system that covers 73 percent of Georgia’s land area in 157 of 159 counties. The distribution areas shown are approximate locations of EMC service areas. Areas shown in white are not served by electric cooperatives. Find the co-op nearest you by clicking on your region of the map. Get to see their headquarters, offices and contact information. Eastern District - 1234 Dawsonville Hwy. Our relationship with Jackson EMC has been wonderful. From expansions to energy audits, they’ve been on our side every time. Our new 559,407-square-foot facility is located in Suwanee. We’re excited about this location that will allow us more room to grow. 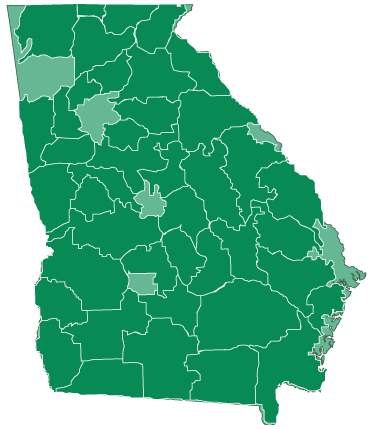 Georgia’s electric membership corporations serve a variety of industries across the state. If you choose one of Georgia’s 41 EMCs as your electricity provider, you'll be in good company.